Autumn is a good time to scan your home for potential dangers to your cat's health and safety. It’s fall, and even if your cat doesn’t go outdoors, the change in seasons bring changes in behavior for humans as well as animals. Some of these are as simple as what kinds of food you eat or whether you use blinds at different times of day, and some of them can create potential hazards to your cat’s health and safety. While cats are seemingly mellow creatures, they can get into all types of mischief. It’s up to conscientious cat parents to ensure the home is safe. 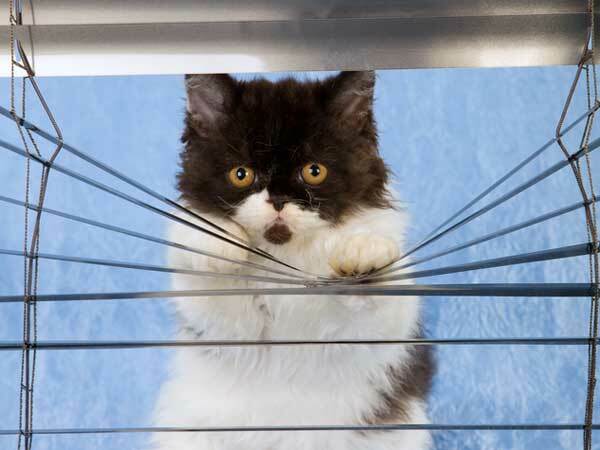 Here are 11 areas you should cat-proof. Never assume your cat won’t eat something. Cats have been known to get into all kinds of surprising foods, including Cheez-Its (guilty in my house), marshmallows, and cookies. Just keep food off the counters when you’re not around and stash it somewhere your cat can’t access. Otherwise, you may have some major GI issues on your hands. What isn’t a toy to a cat? Cords on blinds seem to be made to play with. Unfortunately, cats can ingest the cord, get tangled up in it, or even get strangled. And while cats love to dive through mini-blinds, they can easily get stuck, panic, and hurt themselves. Keep the cords out of reach by tying them up or tucking them behind the top of the blinds. If you find your cat has a penchant for mini-blinds, you may want to rethink your window treatments. Plants have been banished from many cat households. It’s hard to keep cats from gnawing on leaves, and many common household plants are toxic to cats. The Cat Fanciers Association Web site lists more than 200 plants that are harmful to cats; here’s our list of 10 cat-safe plants. But even if the plant’s not toxic, your cat may still leave ragged chew marks on the leaves. If you can find a place to put a plant that’s out of your cat’s reach, like a hanging basket, or if you can train your cat to stay away from the plants, great! You also might be able to divert your cat’s attraction to houseplants by offering a pot of cat grass he can nibble on. Otherwise, you may have to give up the greenery. Cats seek out warm spots, and big appliances usually fit that bill. Especially dryers. Always check the inside of your washer or dryer before you turn it on. You just never know who might be taking a nap in there. Also, some cats don’t recognize a hot stove until they are on top of it and have singed their paws. If your cat is a little slow on the uptake, you can place foil or double-sided tape around the stovetop to keep kitty boo off the hot surface. New items are always alluring to a cat. If you’re decorating your house for the holidays, think about what might be dangerous for your resident kitty. 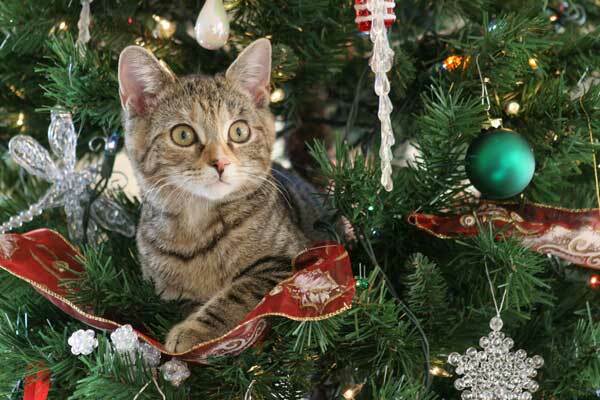 If your cat is a chewer, reconsider dangling things like tinsel or garlands. One year for Christmas I had fake garlands all over the house -ÔÇô until I came home one day to find a pile of cat barf with pieces of the garlands in it. Down came the decorations. Again, don’t make assumptions about what your cat will or won’t get into. Keep cleaning products and medicines stashed away. Also, once you are done cleaning, make sure to rinse drains well. Sometimes cats like to lick freshly cleaned sinks and tubs. Here’s our guide to cleaning your home the cat-friendly way. 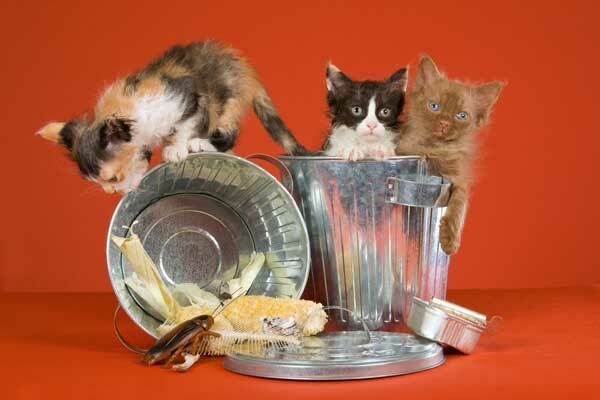 If you have a trash-tipper kitty, you’re going to need to get a can with a secure lid, or you should put the can in a closet. 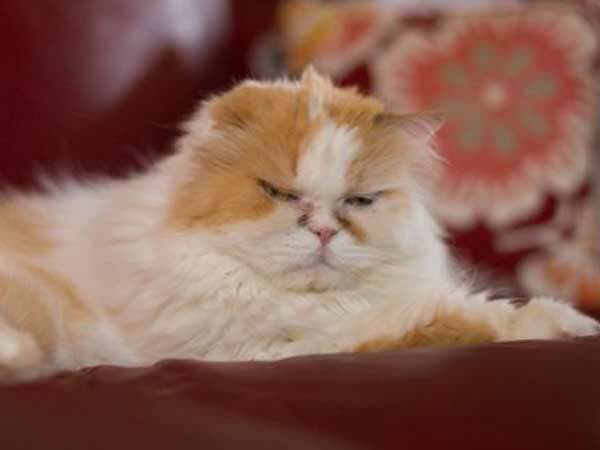 Not only is it a pain to clean up coffee grounds and banana peels, but there could be some dangerous stuff in there — sharp-edged cans, grocery bags that could get around your cat’s neck, and any number of other hazards. Why do cats like to chew on cords? Beats me, but they do. And that can be extremely dangerous. To prevent your cat from electrical shock or worse, secure your dangling electrical cords with duct, electrical, or even packing tape. You can tape cords to the floor or the side of the appliance, for example. There’s really no way to keep your cat off the furniture. If you have a way, please leave a comment below and share! In the meantime, your upholstered furniture is going to take a beating. You can do what I’ve done and get leather furniture (or some synthetic form of leather) or you can use throw blankets, which are super cozy. You might look into furniture covers as well. Like blankets, these can be thrown into the washer. If you don’t have a scratching post or a scratcher, go out and get one. Now. You don’t have to live with scratched up furniture and walls. 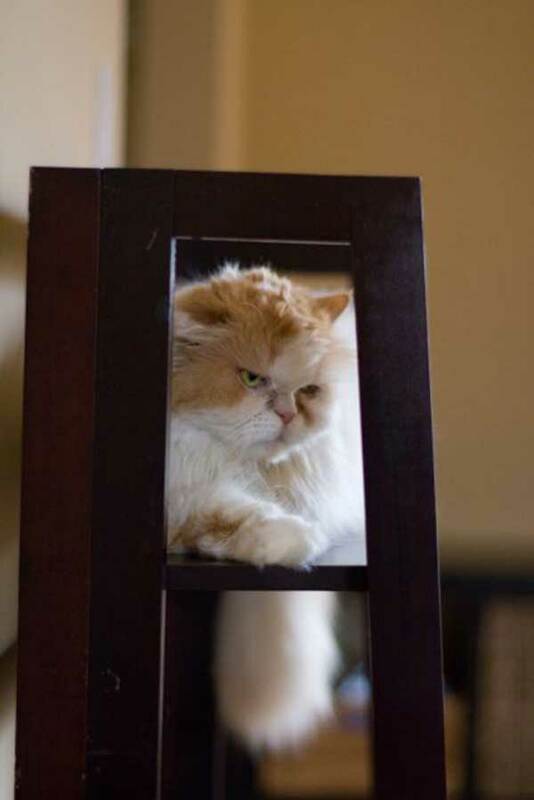 Once you have an "approved" place for the cat to scratch, take some time to make the other surfaces undesirable ÔÇô- use double-sided tape on the surface your cat likes to scratch or secure tin foil around furniture edges. Cats are notorious for climbing everywhere and anywhere they want. And they aren’t always so smart about it. Remove fragile objects, and make sure the shelves are securely fasted to the wall. Also, some shelves can flip if there is a heavy cat on one end, so secure your shelving to the wall or the brackets. Also, try cat trees. Your cat climbs because he wants to get up high on something. Give him options, and he might just forgo the bookshelf. Every cat is drawn to different types of havoc. Some cats chew plants, others don’t. It’s best to be aware of all potential hazards and take measures to keep your home as cat-safe as possible! Do you have a suggestion not listed here? Please share in the comments below!